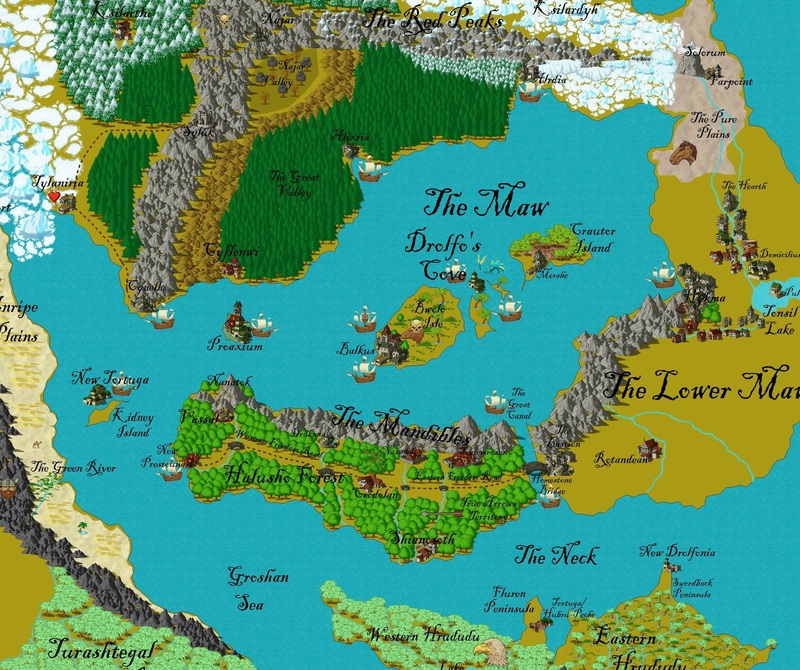 This maps shows the vast trade area influenced by the Merfolk in Gurutama. The Merfolk inhabit the seas, islands, and coasts of the flat world, Gurutama. At the edge of the world the sea runs off, so the Merfolk stay in the central seas where no such threat worries them. The Merfolk have two basic sub races within them, true Merfolk and landwalkers. True Merfolk dwell within the sea and leave their saline environment for extended periods of time. True Merfolk speak two languages, one for the water and one for above it. Landwalkers are a race of Merfolk that can breath air just as well as water. They seen publicly far more often than True Merfolk, leading many people to think that there is only one race of Merfolk. Landwalkers serve as the intermediates between True Merfolk and other races. Without them it is unlikely that the Merfolk would have the significant impact on the world that they do. The Merfolk leadership was never described in our game of Dawn of Worlds, so that remains to be written. However, we did create an active and present patron god of the Merfolk, Drolfo. Many of the tools and skills that the Merfolk have are attributed to Drolfo. He built the Great Canal. He tamed the animals of the sea for the Merfolk. He gave them ships. He modified the True Merfolk to make the Landwalkers. Or so the stories say. Other fantasy worlds would make these stories fact, but we prefer an open interpretation. Whoever decides to DM with those myths as plotpoints may choose which way they go. Still, the stories remain and our characters can debate about which version is true and which version is false. Along with the Avians, the Merfolk were one of the first races to develop a civilization. The two civilizations soon came into contact and conflict. The Avians attempted to win the conflict by building a large nest on the Lower Maw. The nest is marked on the upper left of the Lower Maw as Nanatok. The Merfolk prayed to Drolfo and Selcatnet, the giant octopus, tore apart the nest, causing the Avians to flee. The Merfolk used their superior knowledge of hydraulics to flood the eastern half of Rontu-Aru, creating the swamp it is today. The Avians are a jungle people and they could not adapt to the swamps fast enough to fight back against the Merfolk. The Merfolk won the day and the Avians have essentially be a slave race ever since. If a slave is encountered in Gurutama there is a significant chance that the slave is an Avian with clipped wings. Recently, a resurgence of religious zealotry entered the Avian jungle. More and more crusaders for the Avian god, Izquitl, joined the fight against the Merfolk. The Avians retook the Fluren Peninsula from the Merfolk and rechristened Tortuga as Hubru-Peche. From Hubru-Peche, the Avians flew across the Neck to the Halusho Forest in the Lower Maw. The Merfolk retook Tortuga, but the Avians have become a force in the world once more. That’s about all we got on the Avians from the Dawn of Worlds game, but there’s lots more to come about the Merfolk in the Maw!